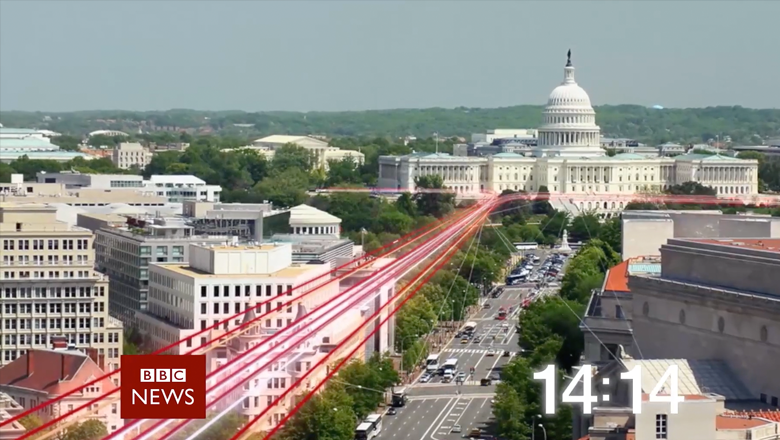 BBC News has revamped its famous “countdowns” that play before programming begins. The clips, which are a staple of the BBC, include a wide mix of footage, mostly focused around correspondents in the field. A fast paced and slightly suspenseful music track, along with the constantly changing numbers in the corner, give the pieces a sense of urgency. The footage also is a bit more colorful and vibrant that spots we’ve seen before. The spots also effectively mix a variety of footage styles — from sweeping aerial shots and rougher field footage to quick pans and shots of the BBC headquarters that look more produced. A common theme in the new opens is the use of interconnecting lines between people, places and devices. This visual device has been used for some time in the countdowns, but these are a more simplified look. There are multiple versions of the countdowns, two of which are shown below.